Chancellor, Vice-Chancellor, honoured guests and graduands, it gives me great pleasure to be presenting today Jonathan Joseph, for the award of Honorary Master of the University. Jonathan was born in Derby and began playing rugby at Derby RFC when he was ten years old. He now plays for Bath Rugby and represents England on the international stage. He joined the England squad in this year’s Six Nations Championship and toured with the British and Irish Lions in New Zealand in 2017. Jonathan attended The Old Vicarage School in Darley Abbey and as a young schoolboy was passionate about tennis. He was the top-ranked in his age group in Derbyshire. In his early teens he also had a short-lived stint at Derby County’s football academy. His dazzling footwork even caught the eye of local dance instructors. But through it all, the allure of rugby, inspired by his father who had played fly half for Northampton, proved irresistible. Jonathan progressed through the ranks, appearing for England in the 2011 Under 20s Junior World Championships and played in the final against New Zealand with the likes of George Ford, Owen Farrell and Joe Launchbury. He progressed in the England Seniors squad in 2012 and debuted against South Africa in Durban. Also in 2012 he was nominated for the Land Rover ‘Discovery of the Season’ Award in recognition of the significant contribution he made to London Irish in his debut year. He made 44 appearances for London Irish, scoring 13 tries. In 2013 Jonathan joined Bath Rugby and has since been playing regularly in the Premiership and European Championships. Jonathan’s power, pace and agility make him an exceptional player. In May 2015 he won the Rugby Players’ Association’s Players’ Player of the Year and England Player of the Year for his outstanding performances for both club and country during the 2014/15 season. He was the highest try scorer for England in 2016 with eight tries including a hat-trick against Italy during England’s grand slam at the 2016 Six Nations. Jonathan was selected for the British and Irish Lions tour to New Zealand last summer where he made three appearances in the famous red jersey, and this year he once again took his place in the England squad for the Six Nations Championship. He has appeared in 24 of the 28 England tests since Eddie Jones took over as head coach at the end of 2015. Jonathan is proud of his Derbyshire roots and regularly comes back to visit Derby RFC when his schedule permits. Unfortunately, Jonathan picked up an injury playing for Bath in April this year which has ruled him out of the remainder of the 2018 Premiership season. We are very grateful to Jonathan for being able to join us today after undertaking further surgery and having a pin removed from his foot only two days ago. We wish him well with his recovery and look forward to his return to the game. As a university which offers many sport programmes, is serious about its sport, and has achieved so much in the BUCS rankings, we are proud to recognise Jonathan and his local roots and celebrate his exceptional success and hard work. He is an inspirational role model for our students, our graduates and our county. 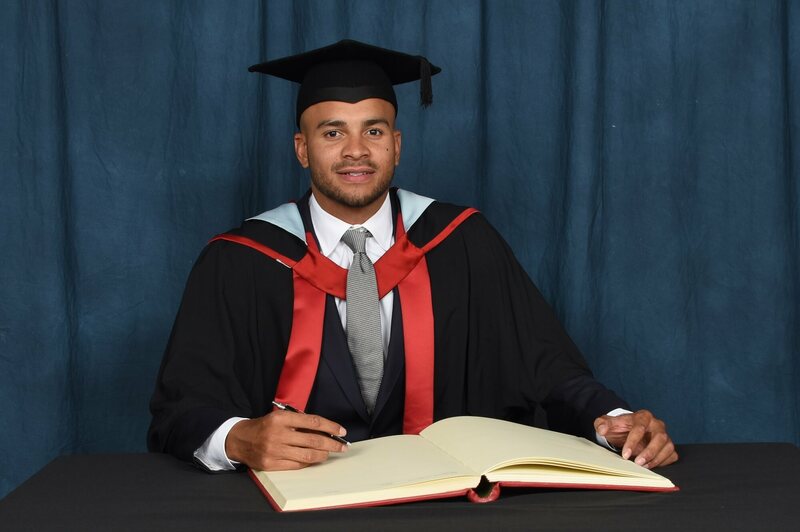 Chancellor, in recognition of his outstanding success as an international professional rugby player, we are delighted to award Jonathan Joseph the honorary degree of Master of the University.